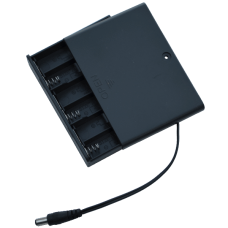 This convenient battery box will hold 6 AA batteries and features and power switch and plug for connecting directly to your Arduino and compatible controller boards. Output is 7.2V when using rechargeable AA batteries or 9V when using standard batteries. We always recommend using rechargeable batteries.